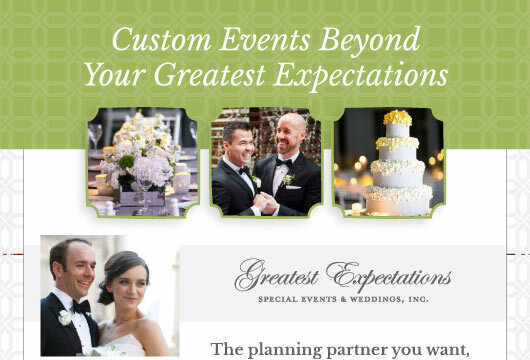 This piece done for Greatest Expectations, a Chicago wedding planner, demonstrates how you can use a PDF digital brochure to generate leads and get referrals. PrettySmart created this PDF to be used as an email attachment for prospects, and it was also given to vendor partners, who used it to recommend GE to their clients. A PDF like this is a great way to help your vendor partners refer you. It’s professionally designed, which makes you look good, and also makes your partners look good when they refer you.